We all know that sewing/quilting isn't the cheapest of hobbies. Most (non-sewing) people seem to think that those of us that try to make things ourselves do so to save money! If they only knew - maybe they'd appreciate things a little bit more. Anyway, things are a little tight around here. We have a plot of land that we hope to build a house on (sewing room included - yes an actual room all to myself and my sewing paraphernalia) so every spare penny goes in the pot in the hope that we'll be able to move in before we retire! 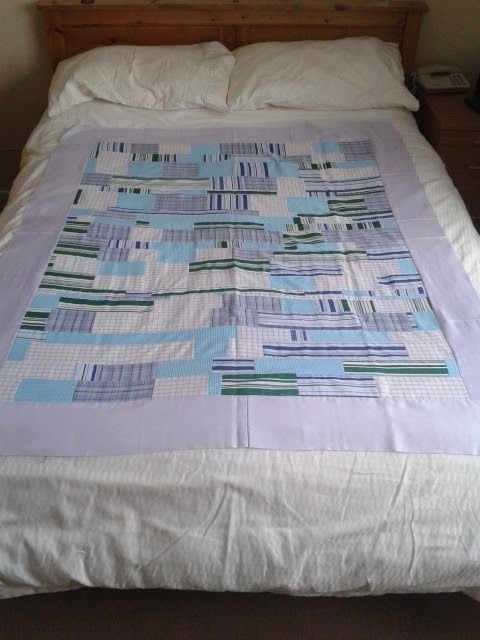 Only thing is I've recently rediscovered my love of patchwork, quilting and sewing in general and after picking up a few hints and tips through some wonderful blogs and YouTube videos I went a little mad at my lqs. Not fabric but the essentials - cutting mat, rotary cutter, ruler (can't believe I'd been cutting fabric with scissors for so long) and other bits and pieces. Bill? Over £100. That's a lot of money. I also bought a walking foot, quarter inch foot and darning foot online. Another £60. All of these things are essential and apart from the odd rotary blade (I'm on my third already!) I'm banking on them lasting a LONG time so in the long term it's not too bad but it is a lot of money to pay out in one go. Problem is I'm trying to stick to a personal allowance of £30 a week. My little moment(s) of weakness above has obviously blown this out of the water recently but I really need to get back on track. Now when you consider that I'm supposed to buy my clothes and shoes, have my hair done, pay for daughters gymnastic lessons etc (I haven't even mentioned my chocolate addiction) out of this money it doesn't leave a lot for fabric. So I've decided that I can have an extra £30 a month to fuel my dirty little habit. Still when you consider that batting and thread has to come out of this allowance too - not a lot left over! I needed to find a cheap supply so that I can build up my stash. At £13 a meter my lqs doesn't really fit the bill so what are the alternatives? UK fabric websites - on the whole by the time you've factored in postage they're not that much cheaper than my lqs (but they do tend to offer a much better selection than my lqs) unless you find a good deal like this one. So what other options are there? Well I'm a strong believer in up-cycling - isn't that where the roots of quilting lie? 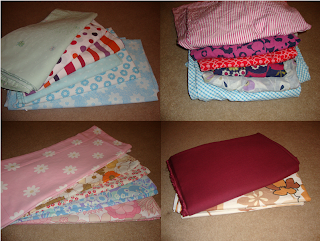 So I started looking around charity shops for 100% cotton garments that I could chop up and turn into quilts. I found that most of the ladies wear, although very pretty and had the look that I looking for, wasn't the right weight. They were too thin and flimsy and I thought that they would be very difficult to work with. Men's shirts however were exactly the right weight! Maybe not always the prettiest of fabrics but if I looked hard enough I could find some pretty decent pinks/lilacs/light blues. So I bought a few shirts, most for around £3 each and then cut them into usable pieces of fabric. I compared these to the size of a fat quarter. Each shirt easily gave twice, if not three times (depending on the style of the shirt - sleeve length/pocket placement etc) the amount of fabric you get in a fat quarter for the same price! I hadn't started to use them but my fabric stash was starting to look a bit healthier. My mum saw what I was doing and she started keeping an eye out for me too. It wasn't long before she phoned and said that she'd bought some shirts for me. However I'd forgotten to tell her that I was only looking for 100% cotton but when she told me that she'd only paid £2 for the six shirts it didn't seem too bad. When she finally got them to me I fell in love with the colours in some of them and decided that I would make a lap quilt for myself out of them if only to try fmq for the first time without wasting the good stuff (designer quilting cotton). There was a lot of waste that came from cutting squares out of non-square fabric and I was loath to throwing them away so I played with them a bit. I cut them all into rectangles as big as their shape allowed. Some were 1" x 10" others 4" x 6" and lots were all the sizes in between! I didn't really have a plan I just sort of made it up as I went along! I sewed all the 1" strips into a long strip, all the 1.5" strips into a long strip, all the 2" strips into a long strip etc. I then cut these down to (if I remember correctly) 44" strips and any strips that weren't long enough I cobbled together (sewed a 3" strip to a 2" strip to make it 4.5" and then sewed it to the end of another 4.5" strip etc) until I had very little scraps left. I then threw these strips on the floor next to the sewing machine and with my eyes closed picked two strips up and sewed them together so that I didn't spend hours deciding on a layout for the strips. It was so much fun working this way - I usually spend hours and hours and hours drawing pictures etc planning quilts so this was like a breath of fresh air. The quilt came out a little smaller that I'd hoped so I went to my stash and used one of the 100% cotton shirts to make a border and ended up with a 50" x 60" quilt top that I love! As these weren't 100% cotton fabrics they weren't the easiest to sew with and my hoover had to contend with a lot of fraying up I really do like the end result. This is going to be my new lap quilt and the 5" charms will have to wait for another day. Only problem is it needs a back and there weren't many scraps left. I made the binding out of a pink 100% cotton shirt and had some of the pink left over. 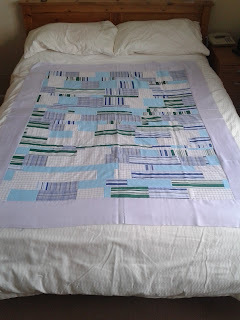 and added the poly cotton sheet to make a quilt back. I almost like it as much as the front but I wish that the cross was a little more off centre (not enough to get the seam ripper out though!) and that there was a little more contrast between the pink star and it's cream surrounding. Look! What's that I see? Blue Skies? In June? On a Sunday? No it couldn't be! I've already got my batting ready (from my lqs) so it just needs basting and then away we go! I'm a little apprehensive about the FMQing but considering that the quilt top and back combined cost me the princely sum of £8 I'm not too worried as if I really stuff it up I haven't wasted a fortune's worth of fabric. As I've said I really enjoyed working on this but it is quite labour intensive to say the least. 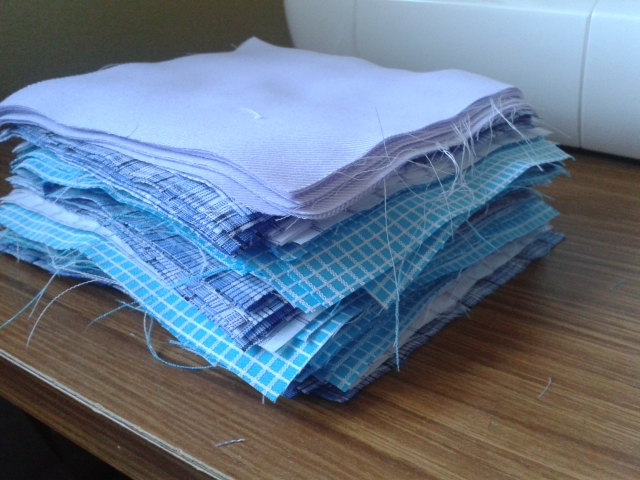 It can take up to an hour to cut up each shirt and although it's quite therapeutic to do in front of the tv I now have a quilt that needs the binding hand sewn to keep me occupied at night. That's only just over the price of one meter of designer fabric at my lqs! Now I know that what I've bought is used and not all of it's 100% cotton but I'm still learning this quilting malarkey and I need cheap fabric to practice on and there is nowhere that you'd be able to find this volume of fabric for this price new! There are one or two fabrics in there that I might regret buying a little (Oh what finding a bargain forces you to do!) but there are others that I absolutely LOVE. As I'm not planning on buying any more fabric (with the exception of one little big bit) for the foreseeable future and it's now after 2.00am on Monday morning (and this is supposed to be SUNDAY stash) I thought that I'd go through one pile a week for the next month (and then I'll have a little big bit of a surprise for you!). Sorry for going on so much. I really need to learn how to write a shorter blog post! Nearly forgot to link up to Sunday Stash at Finding Fifth! I am glad you did not forget at 2am. Lovely to have your post about being resourceful. I do like your shirty quilt top. Yes even i have been very frugal this year saving for maintenance jobs inside and out. Don t forget about fabric swaps and give aways on various blogs. They are such a clever way to get your hands on other fabrics. Great upcycling! I have a pile of shirts just waiting for me to cut into them too. I am not sure if you have an Abakhan store near you, but if you do they are worth checking. I used to find some great quilting cotton bargains in their fabric bins, when we lived in Riga and had an Abakhan store at the end of the road. I still miss it!